Olymp & Hades Textil GmbH is part of the Görgens Group. It is a family business with well-known German fashion brands such as Olymp & Hades, KULT and Jeans Palast (“Jeans Palace”). The company has more than 50 years of history and owns more than 70 fashion stores. On Oct 8, 2009, only 1.5 years after construction began, Görgens celebrated the re-opening of the Olymp & Hades fashion store in the future City Hall Gallery in Essen. 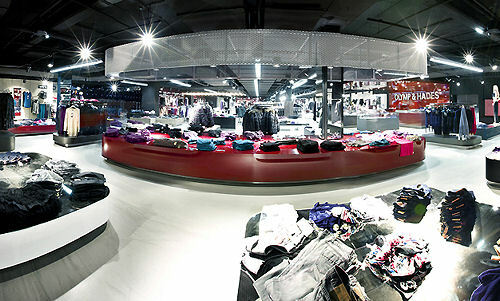 On over 2,000 m² of retail space, highly trendy brand ware is presented in attractive retail furniture. A long spacious escalator provides access to the store located on the first floor. 430 Eyeleds ColorEye® built into the side walls create an efficient and moody lighting. Programmed running lights in various color scenarios draw the visitor’s attraction and guide them to the store entrance on their escalator ride.